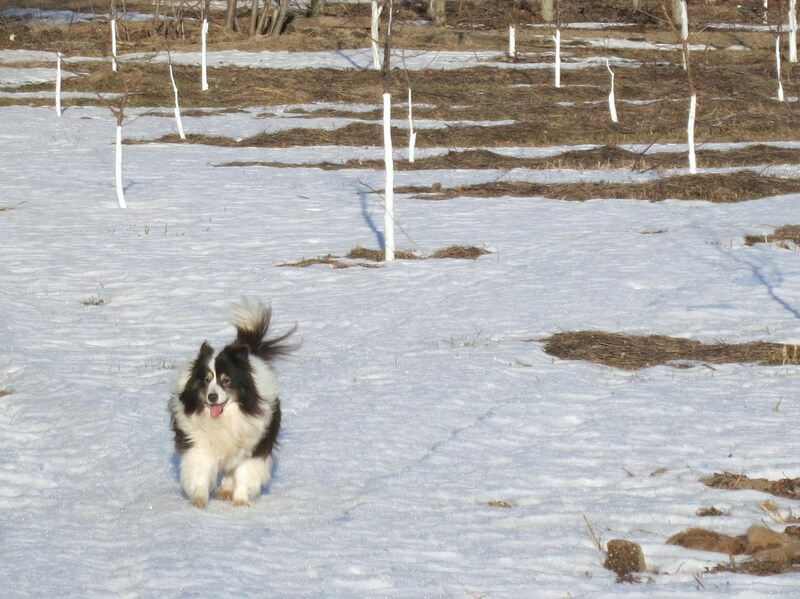 Now that the snow is disappearing, Meesha & I have resumed our morning walks around the farm. This makes us both happy … but especially Meesha! We are not the only ones out walking. 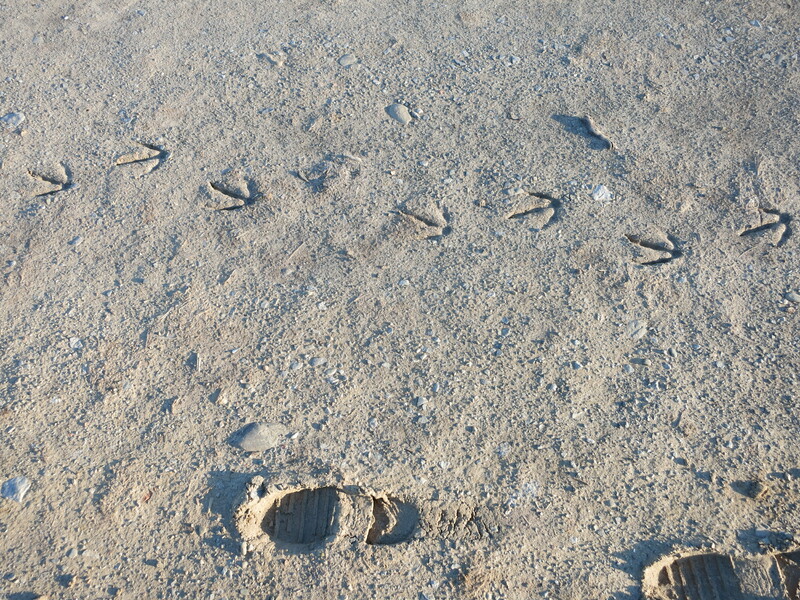 Canada geese have also left tracks on the laneway. Most of the snow has melted. 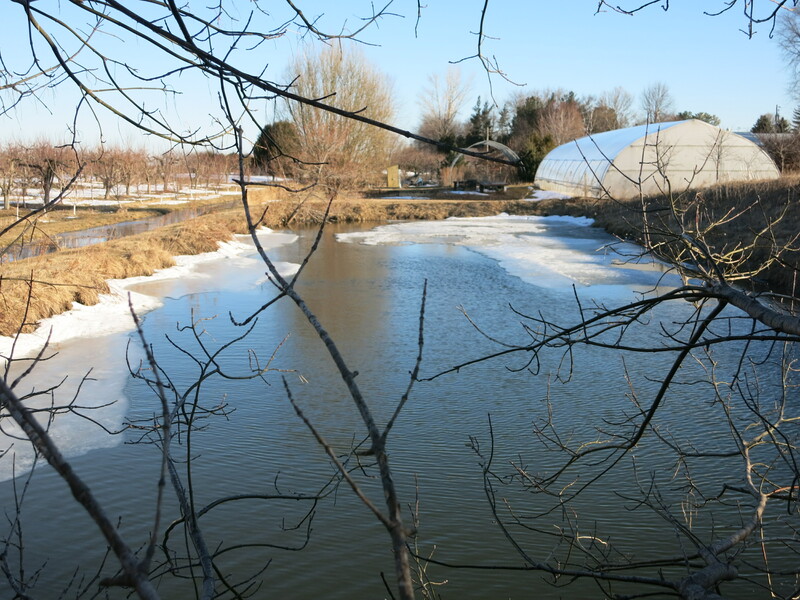 Along the north side of the railway tracks, there is still a crust of the white stuff, especially where snowmobiles roared through the farm all winter. There’s only a small rim of ice left around the edges of the pond. 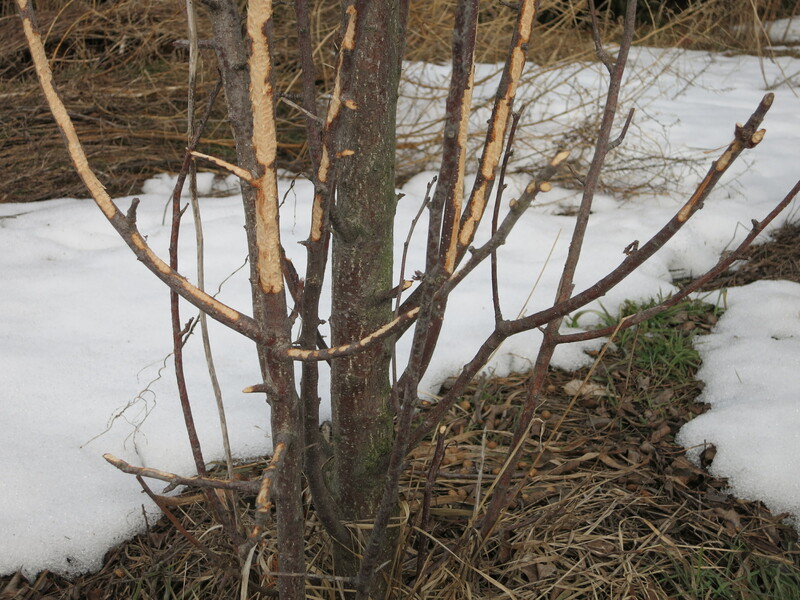 It appears the rabbits were hungry this winter. 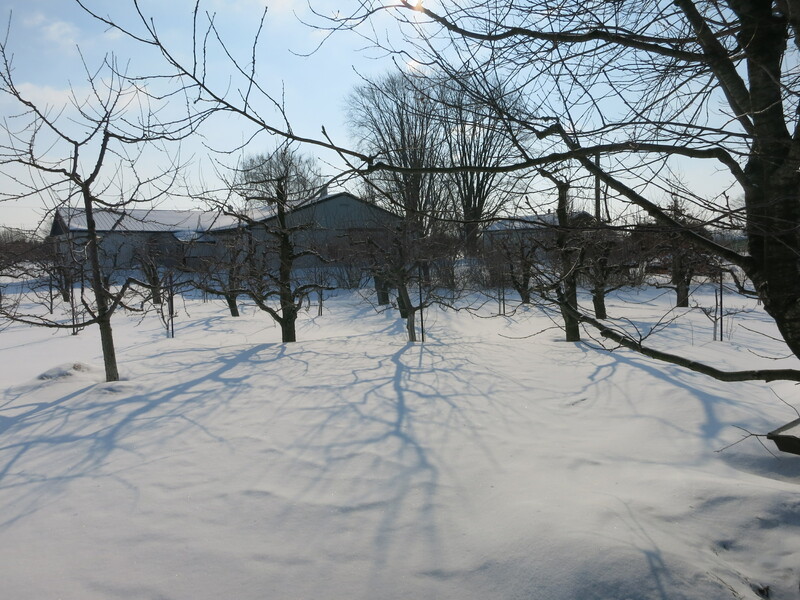 My rows of ornamental crabapples behind the barn have been well chewed. I’m hoping the fruit trees in the orchard don’t look like this! 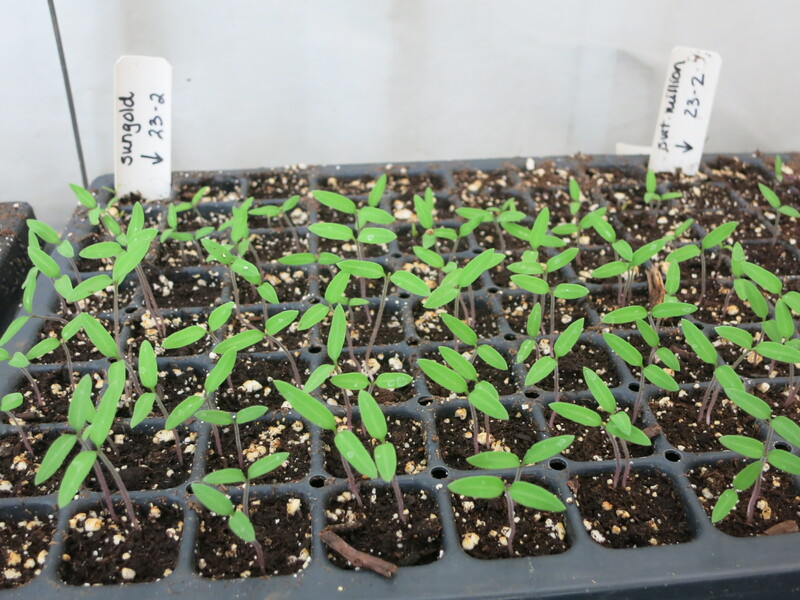 In the greenhouse we continue to plant seeds. 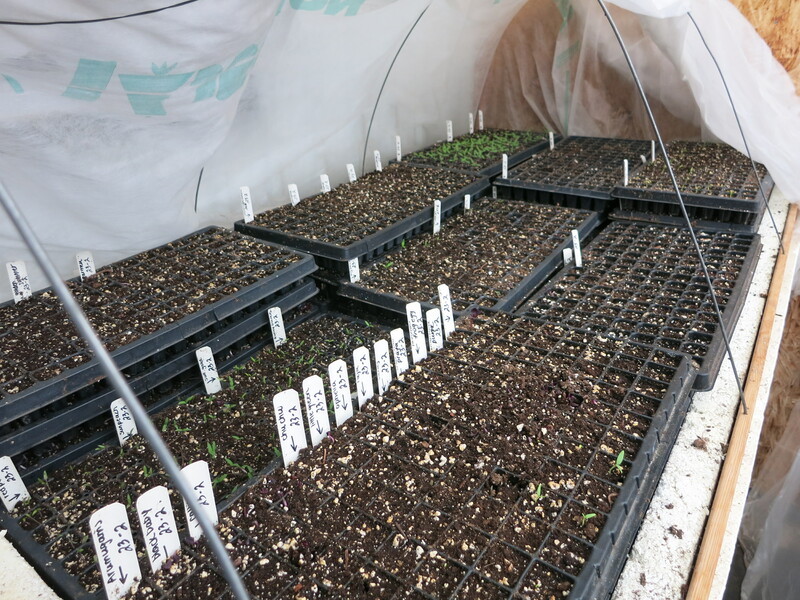 Along with more & more tomatoes, peppers (both sweet & hot), eggplant, onions & herbs are flats of shallots, broccoli, artichokes, celeriac … Space is tight in the germination area, and the trays are stacked up until the seeds sprout. The sunny days provide good growing conditions. 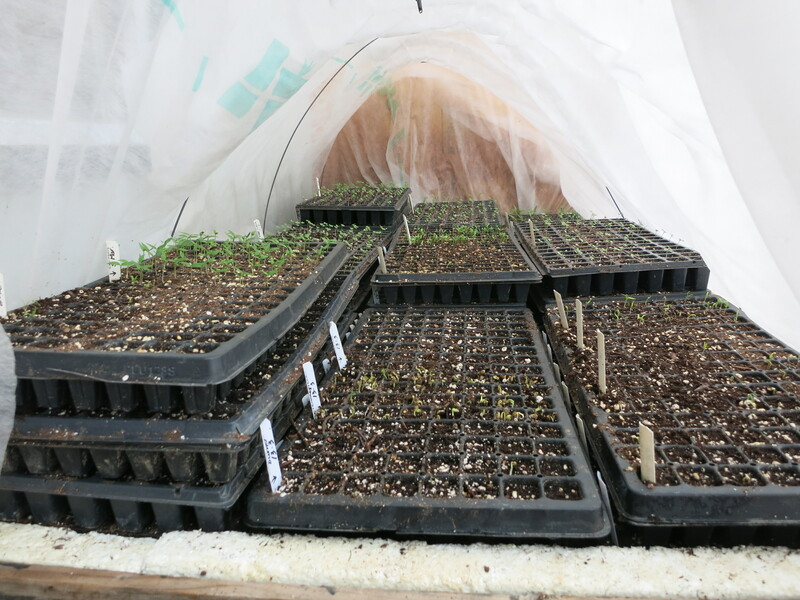 The nights however are still quite cold & in our somewhat primitive conditions, the seedlings require a little extra pampering. 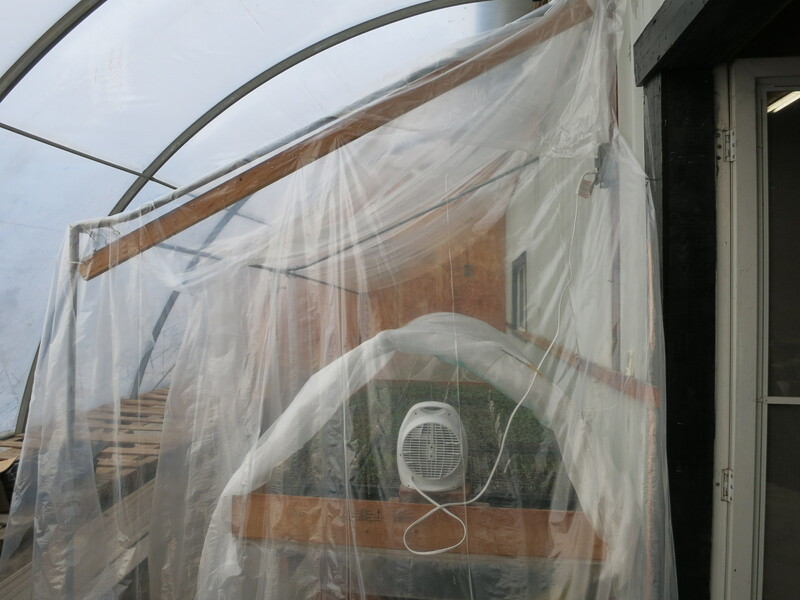 They are growing under row cover, under plastic, in a greenhouse – 3 layers of protection. The last bit of insurance is a space heater which kicks on during the night. 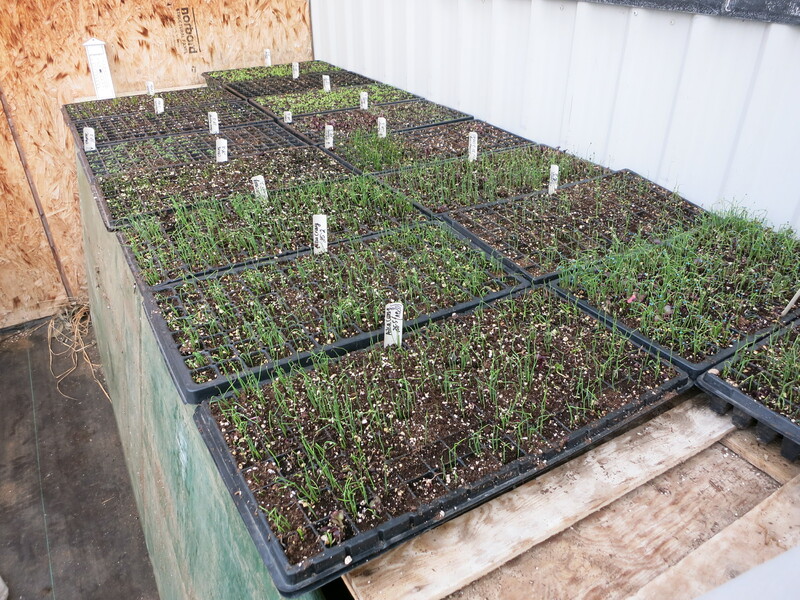 Not perfect conditions nor elegant, but the results are sturdy little plants that will produce delicious vegetables this summer! 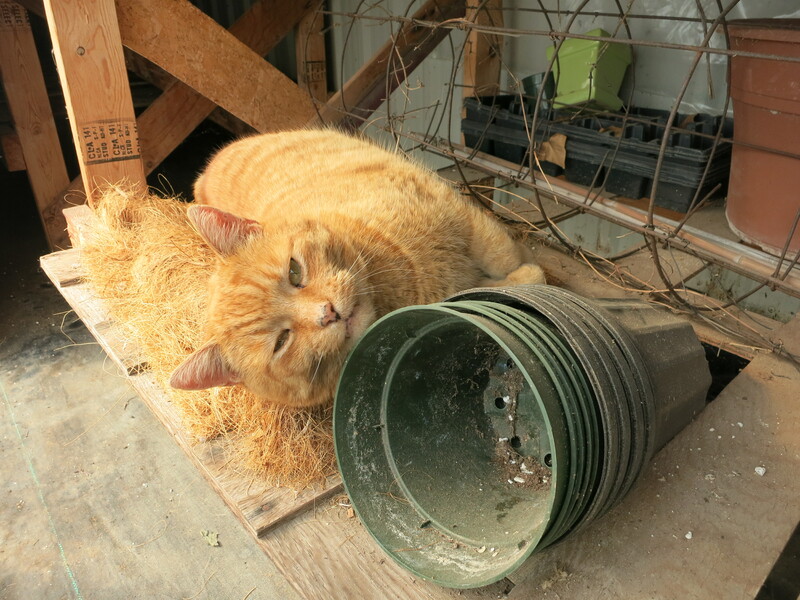 Oliver is a little put out that his sleeping spot has been taken over by the plants. He has been relegated to a spot underneath. 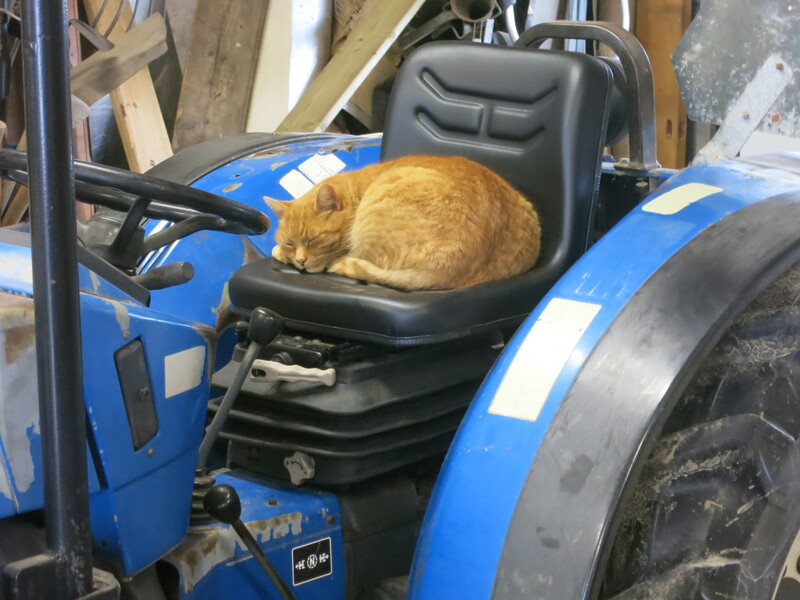 When that gets too warm, he moves into the cooler shop to another favourite napping spot. I haven’t seen it for at least a month now. No, I’m not away, but I guess you could say that the farm is. It’s hidden away under a thick blanket of snow. 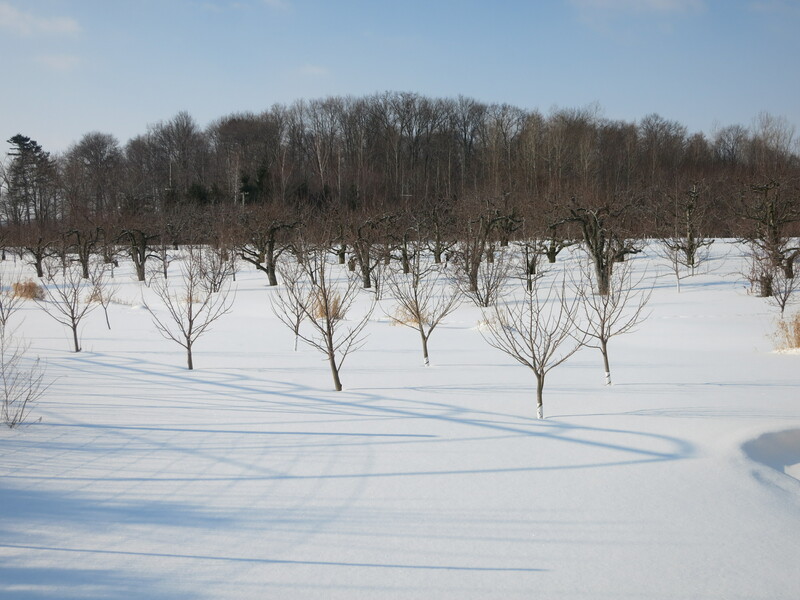 There’s too much snow to walk around the farm, so I have to be content to see the orchards from the barnyard. 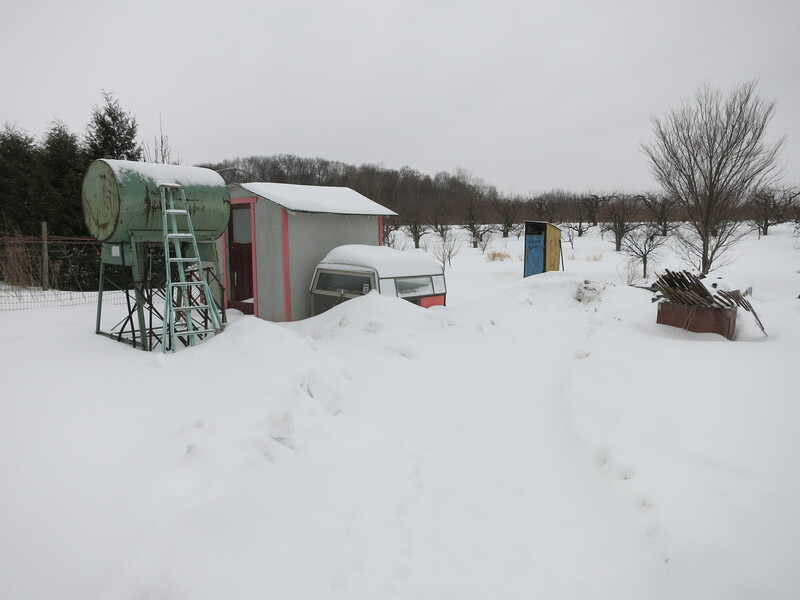 I’ve plowed a path through the snow to the chicken coop & the compost pile – so I can still do the chores. That’s about as far as I go. 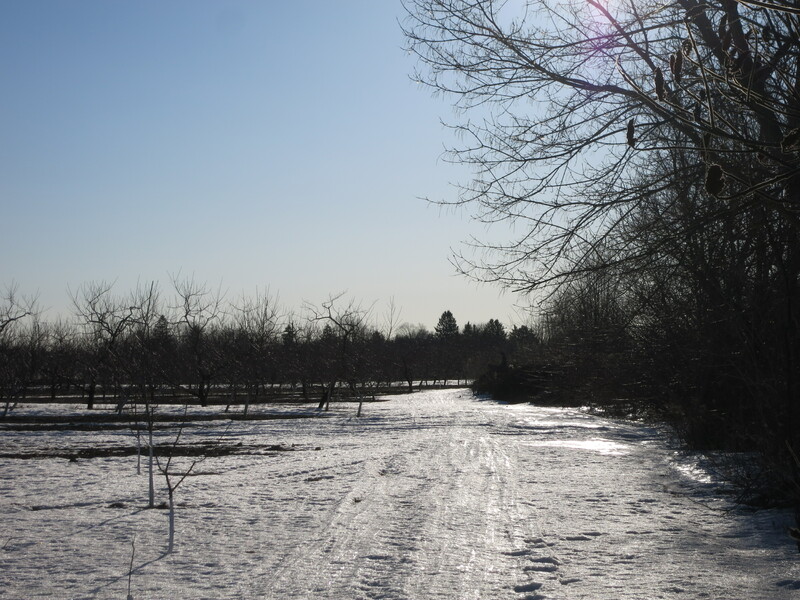 But yesterday Meesha & I managed to trudge into the pear orchard just behind the barn, before we got tired and turned back. Along with the snow has come the cold. 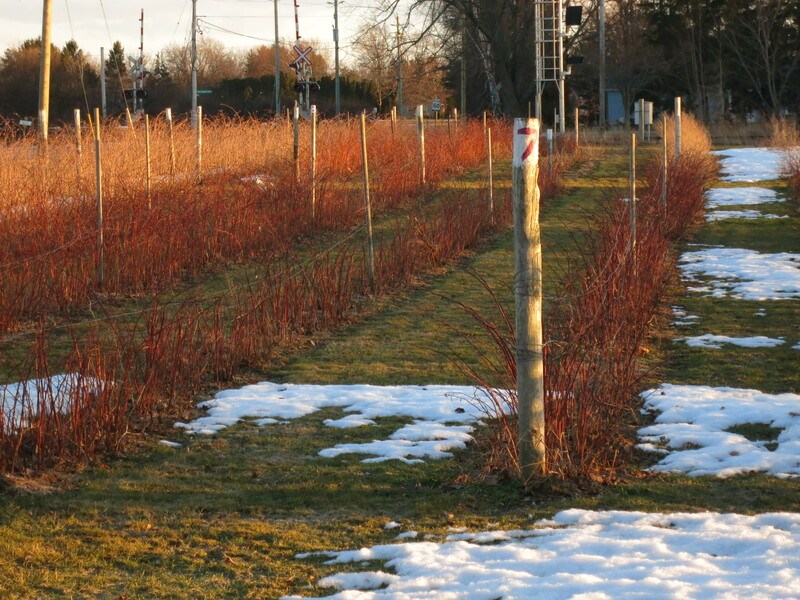 When the temperature gets down to -20C, we know to expect some damage to the fruit buds. At -25C we get concerned about the trees themselves. 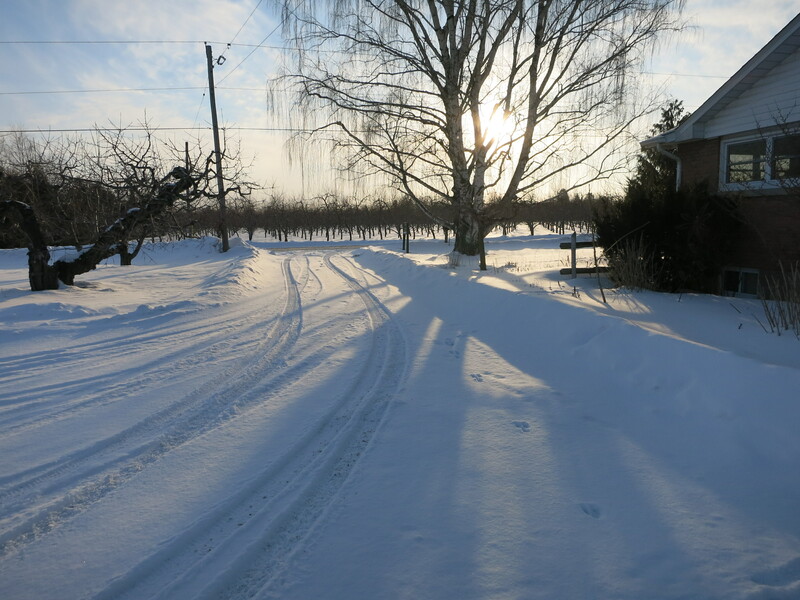 This past month we had at least 4 nights of extreme cold, as low as -23.5C on our farm. The official bud counts for our area show survival rates of 40-50% for peaches & a little less for plums. We’re quite pleased with those figures – we had been expecting more damage. 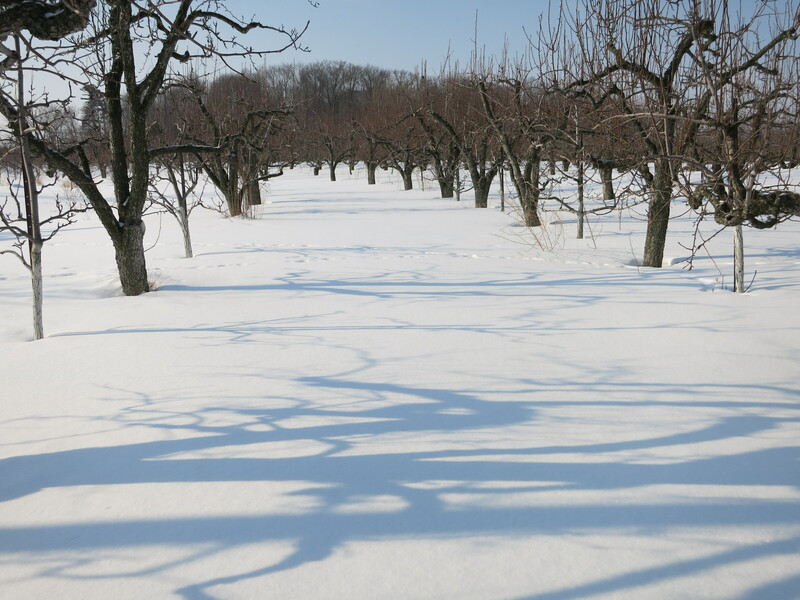 Of course the winter is not over yet … We will not know for sure until May when the blossoms open. But we remain optimistic for a crop! In theory, if even 10% of the buds are alive, we could potentially harvest a full crop – providing they were spaced evenly throughout the tree. 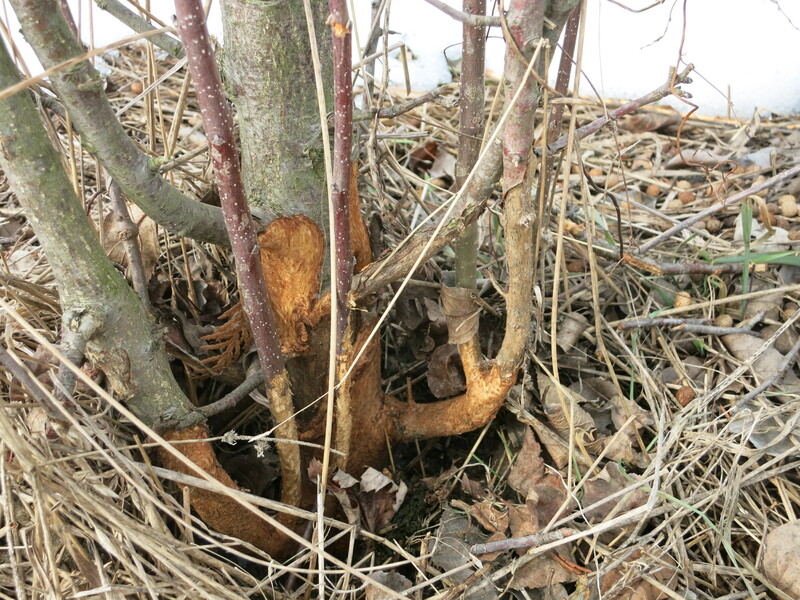 Likely the fruit buds that are alive will be on the highest branches of the tree. 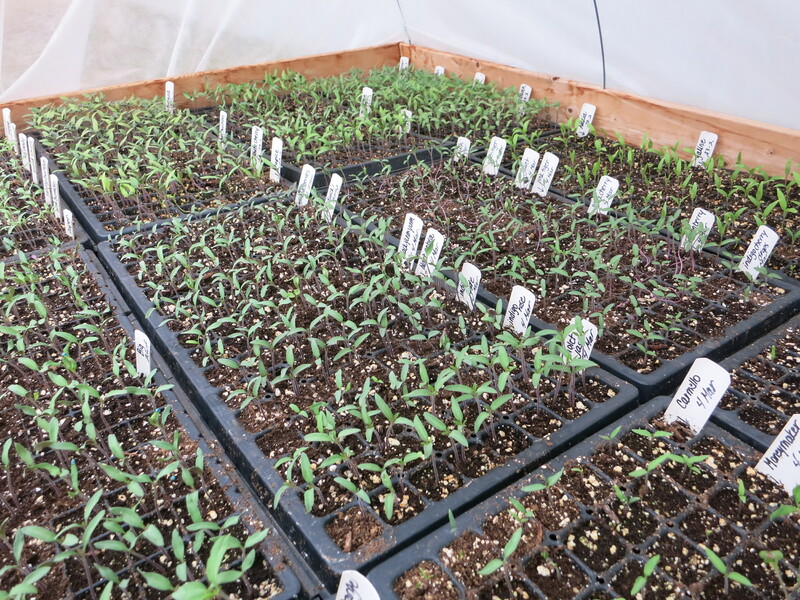 The first of the seeds – tomatoes, eggplant, peppers, onions & herbs – have been sown, and the tomatoes are up. They look so green & bright & fresh, and smell so good. It’s still winter … but spring is coming!